Oooh, don't you just want to be there, on midsummer night preferably? I do (you probably already have since you took the photo, lol). Just gorgeous - it reminds me of your header photo. This looks like such a great place for a relaxing vacation! Another great picture! 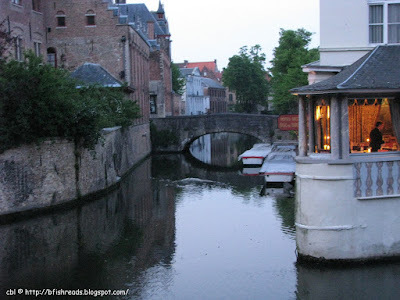 I so have to visit Brugge, it's really gorgeous. Gorgeous! I love the lit up room ... it adds such a sense of warmth to the photo. I would like to dock my boat and go on in for dinner and a discussion of a book! And I love the reflection of the bridge. The more I see of your photos, the more I think I shall have to travel to Burgge someday. So many interesting things in this shot...the water, all the curves and angles, the parked boats, and I LOVE that room with all the light! So incredibly beautiful... What an amazing photo. So pretty. Someday I really must get to Bruges. Very beautiful. Makes me want to plan a romantic getaway!! What a charming little town that looks to be! I love the little lit up room on the right. Looks like maybe someone is cooking up something yummy, while night falls on the canal. Gorgeous! You take such great pictures. I need to start vacationing with you. Gorgeous! Looks like a great place for relaxation! Oh, that is a beautiful picture. I can just imagine sitting there with a nice glass of wine. I wanna be there! Really beautiful. That's looking very, very lovely. Absolutely beautiful - it gives me a feeling of wanderlust - I want to travel! So much to explore there! Lovely! I imagine sitting at a nearby cafe with espresso, reading a lovely book. Another great pic Beth. You really should consider selling some of these. I would definately buy one.